"There are things your loved can't do anymore." There are many things your loved one may not be able to do anymore, like carry plastic grocery bags or braid hair. You can be of assistance for some things. For example, if the senior wears glasses, he or she may need assistance cleaning the lenses because it hurts his or her fingers. Think of the things the individual enjoys, like crocheting or fixing old cars. If he or she may have difficulty with that activity because of arthritis, offer to help out. You can do everything from getting him or her bigger crochet needles for easier handling or even doing some car rebuilding yourself. Not sure how to help? You can always ask. Although it may seem counterintuitive, exercising can actually be a very good thing for arthritis sufferers. When you move about, it loosens your muscles and lubricates your joints which can really do wonders for easing pain. Your loved one may be hesitant to exercise because he or she thinks it will hurt, but you can be at his or her side to be sure he or she doesn't fall or have any other issues. Talk with his or her doctor about any movements that might be good to help your loved one's arthritis issues. Also consider having him or her work with a physical therapist. 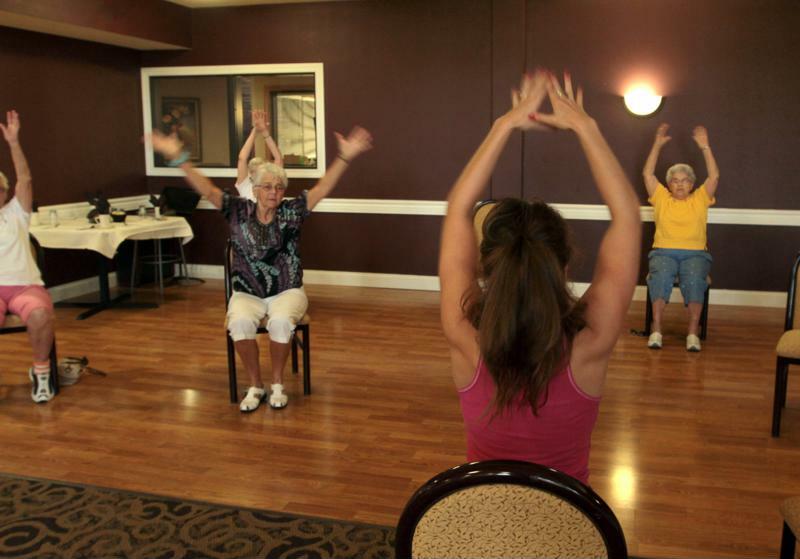 Many assisted living centers provide exercise classes that are aimed at seniors. This means many of the activities take place from the comfort of a chair so everyone can partake. Plus, there are always people on staff to help out if someone does have an accident or needs assistance. Incorporating exercise into a daily routine can alleviate arthritis pain. Most people who have severe arthritis choose to treat their pain through medication. If your senior loved one lives in assisted living, the facility takes care of making sure he or she takes the necessary prescriptions or over-the​-counter meds to keep them as pain-free as possible. You can keep up to date on what these are by talking with the individual's doctor or contacting the assisted living home. People who are in memory care need special assistance taking their medications and receive them from certified caretakers who are on staff around the clock. Following a medication regimen as noted by a physician can help alleviate the pain and swelling associated with arthritis, and make even simple tasks like brushing his or her teeth easier for seniors. Babies need a lot of sleep because they are busy soaking in all the information they can. Older individuals have a similar requirement for breaks because they don't have the energy they used to, and arthritis can make everything more tiring. If you're out with a senior at a social gathering, or even just taking a stroll around an Alzheimer's home, pay attention to how he or she is doing. Some seniors may require a walker or wheelchair to get around, and they may need to stop and rest now and then. Encourage your loved one to retreat to his or her room for a nap if you think it's needed – he or she might not admit to being tuckered out!